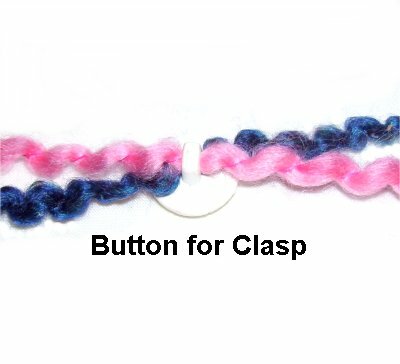 Description: The Simplicity Bracelet is a very easy Macrame pattern, since it features only two simple decorative knots. 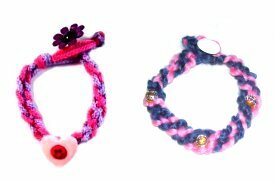 This is a great craft project for young children as well as beginners new to Macrame. 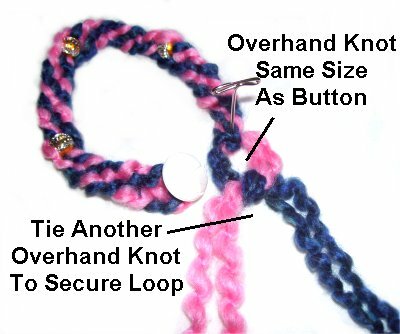 Novelty buttons and beads can be used for both the clasp and for decoration, but make sure two cords can fit through the opening. In the image above, the bracelet on the left was made with nylon. 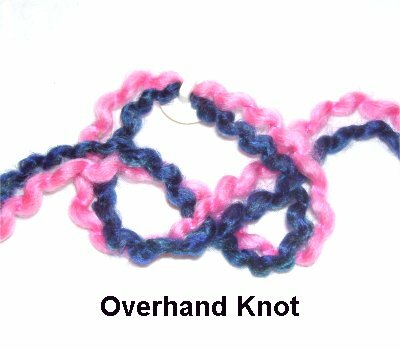 Yarn was used in the bracelet on the right. 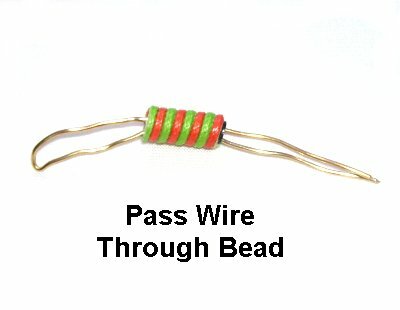 << Fold a piece of fine wire in half and pass it through the bead. Preparation: Cut 2 cords, each at least 45 inches long. Apply glue to the ends to prevent unraveling. Let the glue dry before you get started with the Simplicity Bracelet. Step 1: Slide the button for the clasp onto both cords. Match the ends so the button is in the center. Step 2: Tie a tight Overhand knot using two cords on the right and left. This holds the button in place. Step 3: Secure the button or bead to your board, by placing a pin through the shank. Spread out the four cords. Weave the cord furthest to the RIGHT through the other cords over - under - over, heading left. 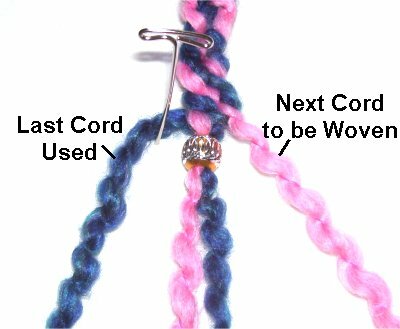 To keep the cords for the Simplicity Bracelet horizontal, place a pin just below the one you used to do the weaving. Bring it down for the next row, arranged vertically. You can lean the pin back over the cord to hold it in place. Do this each time you start a new row. 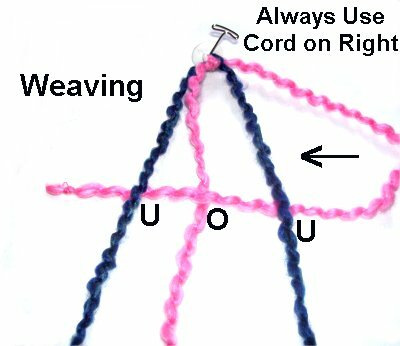 Step 4: For the next row of weaving, use the cord furthest to the RIGHT again. The weaving is the same (over - under - over). 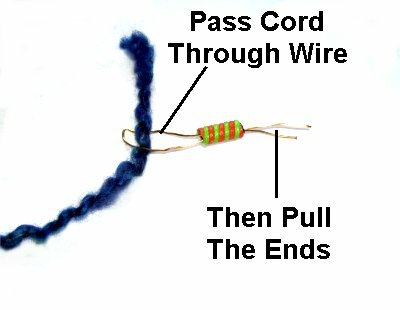 This cord will pass under the one used in step 3. 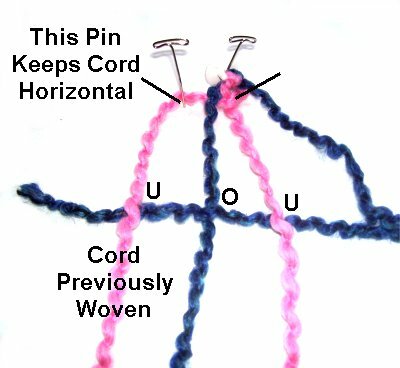 Step 5: To add beads, select the 2 cords in the center of the group, not the cords furthest to the left and right. 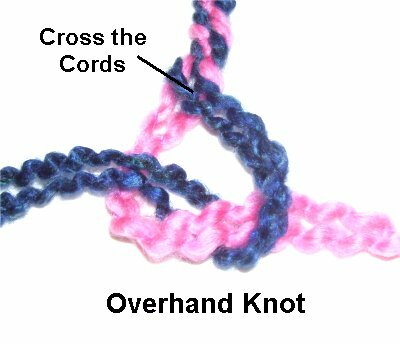 Slide them through a bead, using a wire threader (optional). Step 6: Repeat step 4 - 5 several times, until the bracelet is the size you want. Cross the cords, and then tie an Overhand knot. Apply glue inside as you tighten it firmly. Step 7: Tie an Overhand knot for the clasp, as shown in the image above. Make sure it's the same size as the button or bead. Step 7, continued: Tie another Overhand knot and tighten it firmly. Be careful not to change the size of the previous knot. Apply glue to the knot, and cut off the extra material when it's dry. Have any comments about the Simplicity Bracelet? Contact Me.